Many conditions cause itchy skin with pustules. A pustule is a circular elevation on the skin that contains pus. The base of a pustule is usually red with inflammation. The itching occurs as a symptom of skin irritation or disease. An immune response by the skin cells causes the irritated area to itch. Scratching itchy pustules breaks them open, forming a skin eruption and further complications. Dermatitis is defined as an inflammation of the top layers of skin, causing itching, blisters, redness and swelling. The term "dermatitis" is broad, covering many disorders producing red, itchy rashes. Itchy dermatitis blisters can become pustules as bacteria infect wounds caused by scratching. 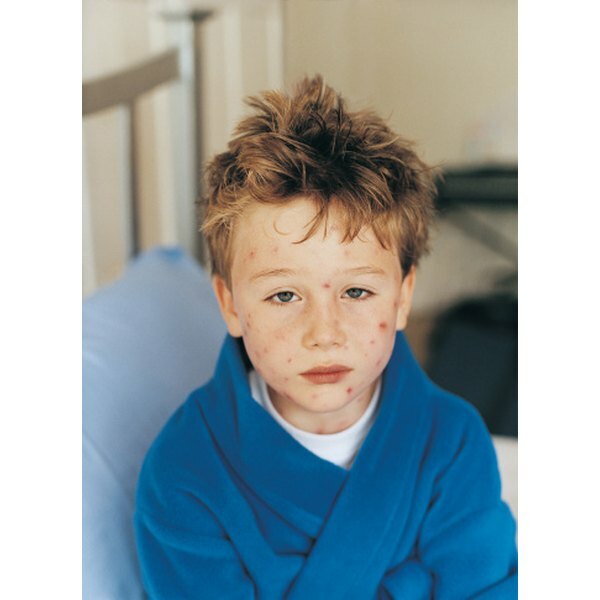 Impetigo is a contagious skin infection caused by Staphylococcus bacteria entering such wounds. Impetigo pustules break open, forming crusts over the infected skin. Chemical or physical irritants, toxic plants, allergic reactions and genetic inheritance predispose a person to dermatitis. Pustular psoriasis is an autoimmune disease appearing on the skin. It is a chronic condition affecting the life cycle of skin cells, causing the cells to multiply too quickly. Usually, this disease affects adults, appearing as a noninfectious white pustular rash. Depending on the type of pustular psoriasis present, it localizes to certain areas on the body, such as the hands and feet. This disease is triggered by medications, topical agents, ultraviolet light, steroids or stress. Herpes viruses usually produce itchy skin pustules. Chicken pox, or varicella-zoster virus, commonly causes red and itchy pustules that eventually rupture and spread the virus. Shingles is a dormant form of a previous chicken pox infection, appearing later in life during periods of stress and/or weakened immunity. Pustules of the chicken pox virus appear on the entire body, while shingles usually is restricted to small areas on the body's trunk. Itchy and painful pustules on genitalia can be a sign of genital herpes, which is infectious, has no cure and can return at any time through flare-ups that can include genital pustules. An infection of a hair follicle is termed folliculitis. This type of infection causes a red, swollen pustule around the hair follicle. Extensive folliculitis, which involves oil glands within the skin, is termed a furuncle. Deep infections with multiple pustule sites are defined as carbuncles. Usually, a bacterium named staphylococcus aureus is the culprit in these infections. These itchy pustules tend to form on the scalp, arms, legs and faces of bearded men. Antibiotic therapy is recommended as treatment. Any damage to the skin that allows bacterial invasion is likely to produce pustules. Insects such as flies, ticks and mosquitoes puncture skin and allow bacteria to enter. Poison ivy, poison oak and other plants inject toxins causing blisters and bacterial pustules. Acne, an inflammatory condition of oil glands in the skin, produces pimples and pustules. Also, fungal diseases such as athlete’s foot and jock itch may form itchy skin pustules.